With over 30 years' experience moving people and their belongings all over the UK, we provide an expert range of removals services including the moving, packing and even storage if you need it. We directly employ a friendly and professional team of removers trained in handling even the most delicate items and delivering them safely no matter what challenges present themselves! Our work and customer service is quality checked year round, with annual inspections to ensure our vehicles and facilities are modern, well maintained and safe. We are regularly presented with Excellence Awards for the feedback customers give us so you can be assured of exceptional removals services. With customers throughout London and Hertfordshire including many auction houses and museums who rely on us to safely transport antiques, statues, fine art and many other valuable and delicate items we are proud to have a reputation for reliability and the safest possible hands. Moving home or business is well known to be one of life’s most stressful experiences, so why not let us take care of it all for you. 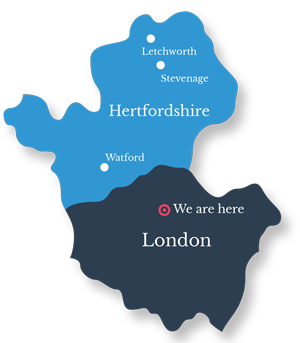 You can find full details of our London and Hertfordshire house moving services on the removals and packing services pages of this website. We also welcome enquiries at any time, experienced members of the team are always on hand to answer questions; contact us at Tyrrells Removals today to arrange a no obligation quotation. Includes Packaging and transportation to and from storage. Fully insured with the latest security. Working to the highest client service standards. All packing and transport to and from storage provided. Secure storage space fully insured. Fully accredited, award winning removals and storage service. Supply of all the packing materials you need. Our team can safely and securely pack for you. Modern, well-maintained, custom removals trucks. Specialists packing of valuables and antiques. If you have an enquiry, please get in contact.